See the requirements for installation. Download the Beaver Themer plugin zip from the My Account page. The download file is named bb-theme-builder.zip. Note: On the My Account page there's a Subscriptions section that shows which Beaver Builder products are included in your license. These products use the same subscription license key, as described in the section below on activating your license after installation. From your WordPress Admin Panel, go to Plugins > Add New > Upload. Select the Beaver Themer plugin on your local system and activate it after it has uploaded. As of Beaver Builder Version 2.1, the plugin is listed as Beaver Builder - Themer Add-On in the plugins list. Note: If you activate the Beaver Themer plugin without having the Beaver Builder plugin installed, you'll see a warning. Also, you won't be able to see the license activation without having the Beaver Builder Plugin installed. 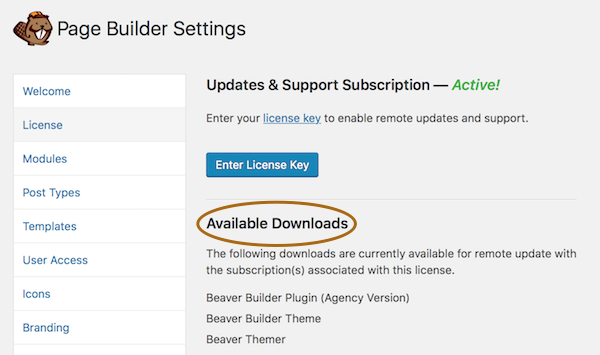 The Beaver Themer license is added to your Beaver Builder subscription, and once you install Beaver Themer, the license in Settings > Beaver Builder (or Settings > Page Builder prior to Beaver Builder Version 2.1) will automatically include it. You can check this as follows. From your WordPress Admin Panel, go to Settings > Beaver Builder. If you haven't entered your Beaver Builder plugin license key yet, enter it. Once your Beaver Builder license is active, you'll see a list of activated products.The following screenshot shows that the Beaver Builder plugin, theme, and Beaver Themer are all active on this website and you'll get update notifications for your site. See I installed Beaver Themer, now what? Check out the plugin troubleshooting section of the Knowledge Base, or submit a Support ticket.